There is a legitimate renaissance in all things dealing with space. In April, Bloomberg reported the latest funding round for Elon Musk’s Space Exploration Technologies placed the value of the privately held rocket company at $25 billion. For perspective, among venture-backed companies, that valuation places SpaceX behind only Uber and Airbnb. This should be a wakeup call for investors. A big wave is on the horizon. It’s easy to get sidetracked. Musk is a colorful character. In his spare time, he is chief executive officer at Tesla (TSLA), a pioneering electric car company. And when he is not sparring with bearish investors, or dismissing stock analysts, he’s musing about magnetically levitated trains whistling through vacuum-sealed tubes at 760 mph, and brain implants to augment humans with artificial intelligence. Somewhere in that hearty mix, most investors lost sight of the big business he was building in the space industry. We are living in an era of unprecedented information technology progression. Many technologies — like cloud computing, artificial intelligence, robotics and predictive analytics — are converging. The common denominator is data. Musk was smart enough to foresee the huge market for rocketry. He understood this new digital era would bring insatiable demand for faster telecommunication networks, and satellites to collect even more data. This year, SpaceX is set to launch 30 rockets. And he is only beginning. 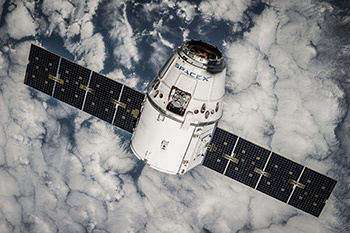 In 2015, SpaceX began working on Starlink, a constellation network of 12,000 satellites. If all goes according to plan, the low-orbit devices will hook up to beam high-speed internet from space to the entire planet. Starlink is an idea that attracted Alphabet (GOOGL) and Fidelity Investments. Together the companies ponied up $1 billion for a 10% stake in the company. In 2018, Starlink won approval from the U.S. Federal Communications Commission to launch the first 4,425 satellites. Thus far, two prototype satellites have been launched. It is the fourth constellation satellite company to win FCC approval. Space News reports that OneWeb, Telesat Canada and Space Norway have received permission to launch 720, 117 and 2 low-orbit satellites, respectively. The nascent constellation business promises to be robust. In the interim, makers of spy satellites are also clamoring for a space ride. This is mostly a SpaceX story. The company completely reimagined the economics of space travel. Its rocket boosters use a super-cooled liquid oxygen propellant that is denser that conventional rocket fuel. This gives the rocket boosters extra capacity. And it also allowed engineers to experiment with reuse. Today, SpaceX boosters lift the payload into space, then carefully return back to Earth to be used again, and again. The technology is a game-changer, giving the Hawthorne, Calif., company an order of magnitude competitive advantage over competitors. My research suggests SpaceX is going to win the launch business, at least for the foreseeable future. For investors, the real opportunities will fall to companies building the new-fangled payloads their rockets will carry. I have been telling my members to focus on companies with real competitive advantages. By design, the Pentagon procurement process is a tough club to crack. Making the grade is an achievement in itself. Climbing to the top of the heap is a big deal. Northrop Grumman Corp. (NOC) is a large diversified aerospace and defense company. Best known for stealth B-2 bomber, Northrop has also become a major player in aerospace. In September 2017, the company bought Orbital ATK, the leading maker of defense communication systems and satellites. Orbital ATK makes the industry’s best-selling small- and medium-sized satellites. GEOStar satellites are used for broadband, mobile communications, data networks, television broadcast and other telecommunications. In addition, the company offers earth imaging satellites and ground support services. The best news is the stock has pulled back from its recent record high at $360. Shares are now trading back at the 200-day moving average near $306. It’s rare that investors get an opportunity to buy this great business at a discount. The stock sells at only two times sales, and 25.8 times trailing earnings, which is reasonable for a business like this. It should rocket again once the recent blue mood lifts on Wall Street. SpaceX? Really? SpaceX can only survive if that fraud Musk sells it. Until them….short it. Liquid oxygen is the oxidizer, not the propellant. SpaceX uses RP-1 for the first stage engines along with the supercooled LOX. RP-1 is essentially refined kerosene.